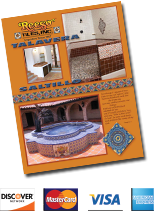 Puebla Collection - Page 1 - Reeso Tiles, Inc.
Beautiful hand painted tile from Puebla, Mexico. Puebla was founded in 1531 as a Spanish colony, with the majority of the settlers from Talavera de la Reina. The Dominican friars from the Santo Domingo monastery in Puebla asked the Order in Talavera de la Reina, Spain, to send friars who could teach local potters the art of tin-glazed ceramics. In 1824 Sir Don Dimas Uriarte established his Talavera Factory in Puebla, Mexico.